So, if you’ve backed it or have been paying attention to the widget in the sidebar, you’ll know that our initial goal was $3000 for 500 books. We’ve had to switch printers because our rep vanished for weeks, and then we got an email saying that he no longer worked for the company. The emails that followed were kind of unhelpful and rare, and when they finally, finally responded to us, their estimate for how long the order would take was weeks after we need these done. As a result, all of the Hiveworks books being printed this spring are going with another company. We requested a quote for 500, 1000, 1500 and 2000 books from the new printer, and for as little as 500 books, the minimum is about $10k. The difference between the 500 books and the 2000 books is actually only a couple thousand dollars, so we’re upping the order to (I think) 2000 books, and we’re getting a pretty nice deal because all together, the books for Namesake, Go Get A Roomie!, Sister Claire and The End will amount to an order of 8000 books, which is craaaaazy. Anyhow, there’s a pretty big difference between $3k and $12k, and while it is getting printed no matter what because we and Hiveworks will be paying the difference, I’d like to be able to make that difference as small as possible. We really want to be able to make this investment worth it, and we really want to make a beautiful book that you’d be happy to add to your collection, so the more we can cover through the Kickstarter the better. This is not where I beg you to up your pledges (though you totally can if you want to! )–you guys are awesome and you’ve already done so much! All I ask is that, if you can spare a minute, tell someone about us! Friends who like Sci-Fi and comics? Send them out way! Local Sci-Fi club on facebook? Share us! Got a webcomic or blog of your own? Twitter? Spread the word if you can. It only takes a couple minutes, and we would be forever grateful. We are currently sitting at $4829! If we can manage to get another $1171 pledged, EVERYONE who pledged, even in the lowest tier, will be receiving a sweet mini-print in the mail (unless they opt out). And if we do reach that goal, I’d love to know who YOU would like to see on that poster. So far we’ve only had one person respond, and Raine is winning. Kickstarter aside, this week has been busy. 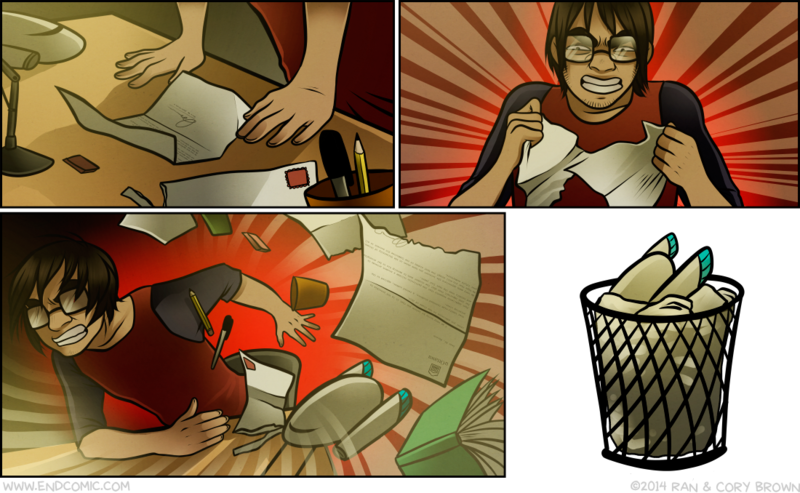 I am completely done Henri’s side-story, and am currently drawing the first seven pages of chapter 11. I’ve posted a few rough sketches I did in photoshop from panels from those pages, featuring two new characters who I’ve been super excited about introducing for over a year now! You can see those here and here. Anyhow, the more I type here, the less work I am doing! Enjoy the sketches, we’ll see you Tuesday!